Mantra is a vibration that nurtures the soul. It is God’s phone number. Simran means to practice meditation, remembering God’s name in your heart and on your lips with every breath. In essence it means that whenever you call up God, your soul radiates. Kaur is a name that all women receive – The Princess/Lioness of God who walks with grace and strength throughout her life. Mary has been blessed to live as Mantra Simran Kaur, the Princess/Lioness who focuses her mind on the radiance of her soul by meditating on God’s name. Mary believes that yoga is not self-improvement, but the awareness to be humanly human and divinely inspired. Yoga is calming the waters of the mind to find the inner peace, the essence of ourselves. 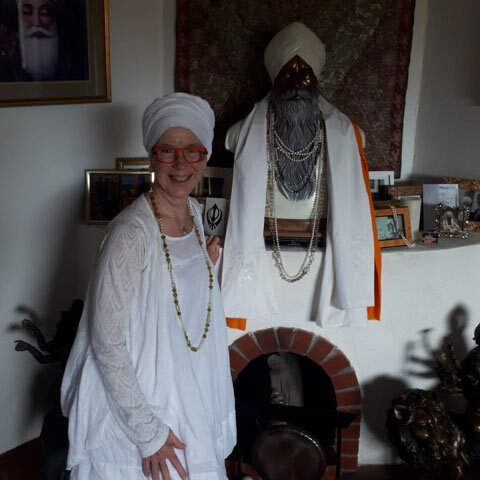 In The Yoga of Awareness, Kundalini Yoga, as taught by Yogi Bhajan, Mary utilizes this ancient yogic science and technology and focuses on the activation of the vital life force or kundalini energy located at the base of the spine. As we connect our personal intentions and activated kundalini energy (kundalini-shakti) to pure consciousness (kundalini-shiva), deep meditative states of peace, bliss, and connectedness are the organic results. Being alive and aware in the present moment gives us the gift of wonder and amazement as we explore our life with each breath. Mary is a native of Seattle but has lived in Boise for the last 34 years. It was in the Seattle’s environment that she was introduced to yoga and to the teachings of Yogi Bhajan. Mary is certified through Yoga Alliance and Kundalini Research Institute as a KRI Certified Practitioner of Kundalini Yoga and member of the Aquarian Teacher’s Academy. She is an accomplished musician playing in various groups around town with her Euphonium and playing in a Kirtan group with her Harmonium. Mary enjoys teaching all types of yoga and bringing in the added dimension of sound. Mary retired 3 years ago from the Boise School District after spending 35 years as a teacher and school counselor.